The students of Deering High School in Portland, Maine, had a pep rally yesterday. They were cheering for Allan Monga, a junior at the school, who traveled to Washington, D.C., to compete in the Poetry Out Loud contest. It's a competition run by the National Endowment for the Arts and the Poetry Foundation to recite great works of poetry. Monga says he fled violence in his home country of Zambia, and he was initially barred from the national finals because he's an asylum seeker, not a U.S. citizen. Well, a judge recently granted a motion allowing Monga to compete. And before the start of today's competition, he came into our studios. Allan Monga, welcome to the program. ALLAN MONGA: Thank you very much. I'm glad I'm here. SHAPIRO: Why was it so important to you to compete in this that you were willing to sue to be able to do it? MONGA: I am not the only kid who's an immigrant. Like, the Portland Public Schools themselves have a huge body of kids from all over the world who are definitely in my situation. SHAPIRO: In your situation, meaning seeking asylum but not yet resolved. MONGA: Seeking asylum, yeah, exactly. So I wanted to create a way that, like, kind of opened the door for everyone. But that is just something that I thought needed attention and, yeah. SHAPIRO: Well, it certainly got attention. SHAPIRO: How did you feel when you found out you'd be able to compete? MONGA: I was super excited. I think, in a good way, it added a little bit of pressure, like, I had to practice more. I just went in hard. I started practicing and, yeah. SHAPIRO: I mean, you're talking about competing and going hard. And a lot of students your age, people would think you're probably talking about soccer or baseball or football. No, you're talking about poetry. MONGA: Poetry is like a whole new world to me. Back in my country, I did not have anything about poetry. But poetry is something that I got to learn once I got here. You know, I did research. It's just something - like, I developed feelings for it. It's like I'm in a relationship with poetry. SHAPIRO: Was that because of one teacher who introduced you to poetry? MONGA: Definitely, yeah, Ms. Callahan (ph). I mean, I was just sitting one of the days in our class and she was like, do you want to try this? I was like, maybe, no. But I did a couple of research and it was just like magic. It happened. And I will tell you, it is addictive. Your feelings or passion for it grows every day. And honestly, I would not let anyone stand in between the relationship I have grown for poetry, yeah. SHAPIRO: Do you remember when you first discovered poetry who the first poet was that really connected with you in a deep way? MONGA: Claude McKay, "America." That was the poem that, like, caved way for every other poem. SHAPIRO: Even though that's not one of the ones that you're competing with here in Washington, D.C., at the national competition. SHAPIRO: Would you still recite it for us? MONGA: OK. "America" by Claude McKay. Although she feeds me bread of bitterness and sinks into my throat her tiger's tooth, stealing my breath of life, I will confess, I love this cultured hell that tests my youth. Her vigor flows like tides into my blood, giving me strength erect against her hate. Her bigness sweeps my being like a flood. Yet, as a rebel fronts a king in state, I stand within her walls with not a shred of terror, malice, not a word of jeer. Darkly I gaze into the days ahead and see her might and granite wonders there, beneath the touch of time's unerring hand, like priceless treasures sinking in the sand. SHAPIRO: There is so much going on in that poem. What is it about that poem that connects with you personally? MONGA: It talks about the good and the bad of America. And me as an immigrant, I can come across the challenge - example, what's going on right now with the NEA trying to say I cannot compete. To me, that's considered as a challenge. But the good, they said I can compete. I had people, the entire Portland Public Schools, everyone has just gone above and beyond to make sure that I'm here today. And I don't know, that poem to me is just like music to my ears. SHAPIRO: Allan Monga, thank you for coming to talk with us. MONGA: Awesome, thank you. It was a pleasure. 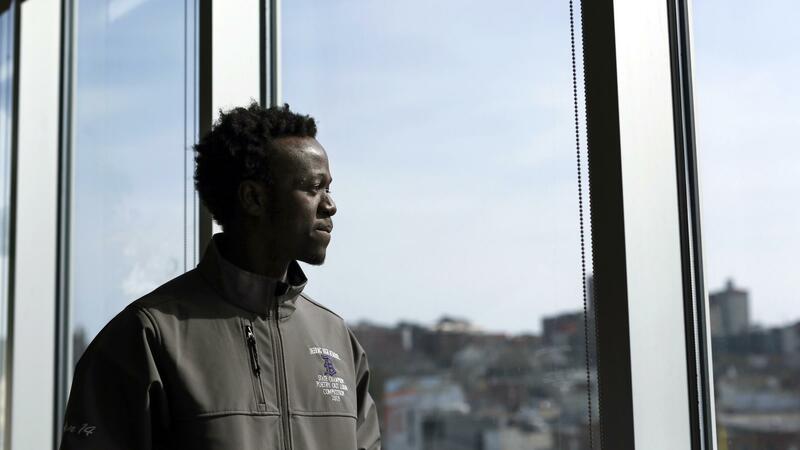 SHAPIRO: Allan Monga represented the state of Maine in the national Poetry Out Loud competition today. He recited two poems but did not advance to the finals. Transcript provided by NPR, Copyright NPR.